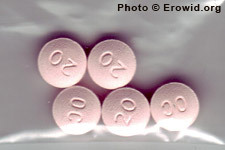 Oxycodone is an semi-synthetic opioid analgesic, used primarily in the treatment of pain. It saw a significant increase in recreational use when the higher-dose time-release form OxyContin was introduced in 1995. In 2005, Jakubska et al. published a finding that oxycodone is produced naturally by the shrub Epipactis helleborine. Oxycodone preparations may contain analgesics such as acetaminophen, which can be toxic to the liver in high doses.